Eminem is a legacy act, which is to say he’s white, past his prime, and severely overrepresented on the festival circuit. On Tuesday, Bonnaroo unveiled its 2018 lineup where the real Slim Shady leads headliners Muse and The Killers—two other routine festival-cappers. For those keeping track, Eminem has appeared on just about every major festival lineup thus far, including Coachella, Governors Ball, and Boston Calling. So, if you’re planning on going to a festival this year, you will be forced to suffer through an Eminem set. Sorry? Festival homogeneity is nothing new, but it truly seems to be reaching its breaking point—a lot of music festivals look exactly the same. But if we’re going to get some repeats, why on earth does it have to be this guy? 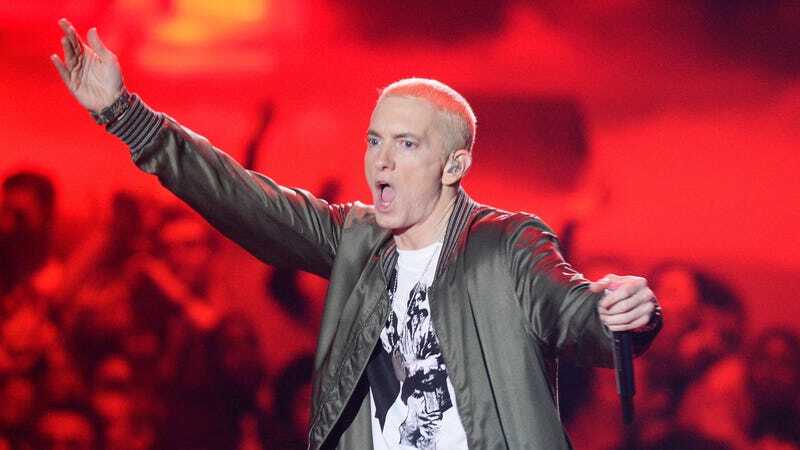 Eminem has entered the bearded, allegedly mature era of his career, after sputtering his way through problematic accents and a poor imitation of rapper Twista. He’s not...totally hot anymore. Listen, I get that these huge festivals are a.) extremely hot b.) expensive c.) usually offer an alternative from line two or three who overlaps with the headliners every night. If you’re not interested in Eminem’s shtick of late, there should be an option on the B stage. Whether it’s Bassnectar, Khalid, Bon Iver, or, hell, even Dua Lipa—sign me up for the counter-programming.